In the late 1970s the Washington Bullets National Basketball Association team created a slogan that summarized the team’s never-say-die spirit. “It ain’t over till the fat lady sings!” was the cry for the team that made it the NBA Finals two straight years and won the championship in 1978. On Monday the 11th Circuit Court of Appeals in Atlanta released its opinion in the long-running lawsuit between the University of Alabama and artist Daniel Moore. Moore originally became known for paintings of famous scenes in Alabama Crimson Tide football history. His first work depicted Alabama linebacker Barry Kraus stopping Penn State’s fullback as he attempted to leap over the pile into the end zone on fourth down in the 1980 Sugar Bowl. That stop sealed the Tide’s 14-7 victory over Joe Paterno’s Nittany Lions and added another national title for the Tide. 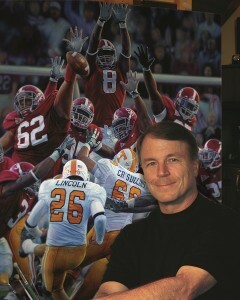 Daniel Moore is the United States Sports Academy's 2005 Sport Artist of the Year and annually paints the school's College Football Game of the Year selection. After almost two decades of painting and selling his paintings and prints, in 2000 Moore was told by university officials that his works infringed on the school’s trademark rights. After five years of fruitless discussions Alabama filed suit in federal court in Birmingham, Ala., in 2005. The civil complaint accused Moore of violating trademark rights by painting depictions of famous scenes from past Alabama football games. Moore denied the allegations and the litigation began. The University also accused Moore of improperly profiting from the sale of memorabilia on which he mounted depictions of his paintings. The university based its legal arguments on the position that Alabama’s football uniforms, and indeed the color crimson that adorned the uniforms, was clearly a trademark of the college. As such, no one could use that trademarked material in any business venture without paying a licensing fee to the university, Alabama officials argued. After numerous delays the trial court ruled in 2010 that Moore’s paintings and prints were in effect protected speech under the First Amendment to the U.S. Constitution. Moore’s artistic expression was individual to him and as such no entity could deny him his right to express his feelings through original art. The court did rule that facts had been presented that would support the university’s contention that memorabilia such as T-shirts and coffee mugs were not protected under the First Amendment. The university appealed the lower court ruling. Once Moore became aware of this he filed a cross appeal seeking to overturn the second part of the lower court ruling. The matter had been before the appeals court for well over a year. Oral arguments were held early this year and on June 11 the court issued its ruling. Regarding Moore’s First Amendment freedom of expression the court noted, “Moore’s paintings, prints, and calendars very clearly are embodiments of artistic expression, and are entitled to full First Amendment protection.” The court also ruled that more facts need to be developed by the trial court to issue a final ruling on the memorabilia issue and it remanded that portion of the case back to the trial court for further proceedings. The University of Alabama can ask the appellate court to reconsider its ruling. That motion is frequently filed by a losing party and is unlikely to succeed. The university may then ask the U.S. Supreme Court to take up the case. Legal experts seem to agree that this would be unlikely to happen. The weight of past court rulings favors Moore. The University of Alabama entered into an agreement years ago to market its licensed products through The Collegiate Licensing Company (CLC). This business was founded in 1981 by former Alabama football star Bill Battle, who also coached the University of Tennessee football team from 1970-1976. In the past 20 years profits from the licensing of products have soared at Alabama and at many other colleges. CLC alone counts almost 200 colleges among its clients. Artists and news organizations lined up on the side of Moore in this case. Numerous universities and licensing companies lined up on the side of Alabama. What is ironic about this case is that Moore, his wife and his daughters are all alumni of Alabama. Moore over the years has voluntarily licensed a number of works he has produced and the university has made money off of these licenses. It is estimated that the university’s cost in legal fees and lost revenues since the lawsuit was filed amount to around $2 million. Moore has been represented by Birmingham attorney Steve Heninger. Many have portrayed this as a David vs. Goliath clash. The university’s main argument was that under trademark law a color can become a trademark. Its attorneys relied on the 1995 U.S. Supreme Court opinion in Qualitex Co. v. Jacobson Products Co. 514 U.S. 159 (1995) in which the Court stated that a color could acquire the protections of a trademark. In the present case the 11th Circuit noted that this is only true where it can be shown that a color has acquired by use over time a “secondary meaning” due to the public’s association of the color with the university’s products or services. This is easier to prove when the focus is on a “mark” or logo as opposed to a trademark. In this case, the Court decided that there was no clear proof that a particular shade of “crimson” is clearly and only associated with the University of Alabama. The Court relied further on the Lanham Act (15 USC 1052 ff) that states that only a producer or seller of a product can acquire exclusive rights to that product. Here the “product” was paintings that were products of Moore’s own artistic imagination and talent. The university could not usurp those rights. Finally the Court also had before it information on the 1990 Visual Artists Rights Act (17 USC 106 ff). This law clearly gave the “moral rights” to artistic creations to the artist who created a work. Many have felt that the University of Alabama has spent years simply trying to grind down Moore. It remains to be seen whether the university will accept the court’s ruling. It does appear, however, that Tide fans can look forward to new works by Moore for years to come. Read the 11th Circuit Court of Appeals complete ruling here.